If you're like me and have an undeniable obsession with accessories then you'll appreciate this post! #1. To create a changeable cuff designed to give my watch an illusion of a wider one-pieced band. #2. Use more of the feathers from the archives of my craft closet for an upcoming dinner party. Taking inspiration from your own accessories to produce new accessories can be quite liberating, it allows ample versatility to a wardrobe. This DIY had me in craft-mode immediately after work, fully excited, and with consumed with plenty of ideas to complement my future outfits. Yes, it is that simple! 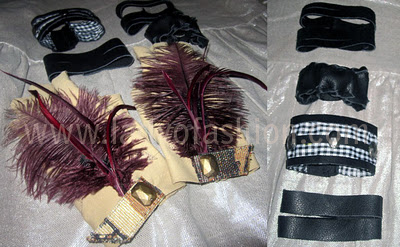 From shoulder pieces, to avant-garde gloves, and embellished cuffs DIY delights were definitely on the menu! *And, perhaps a glass of prosecco for your victory finish! For this project I cut (desired width of) leather into two strips that would fit my wrist band size and added 5cm for detailing, which for me was going to be the slits, or twisting that I made for a decorative effect, if you merely want a solid band then skip this step, and just cut strip(s) of leather following the next step: Measure your wrist (this number is without elastic measurement, therefore my measurement was 15cm/6" + approx. 2cm/0.75" for ease and approx. 4cm for pull-on length = cuff band), then cut leather into desired width + total length of cuff band. You're pretty much finished, however contingent on what extras you would like to add you may now enjoy your new cuff band! I am using mine as a watch accessory, giving my skinny watch an edgier and wider aesthetic. By using an old pair of gloves I decided to cut the tops of each finger to create finger-less gloves. Next, I stitched around each finger to secure the edges (optional). Cut a circular or square patch of felt approx. 4cm/1.5" or smaller depending on the size of your feather(s). Stitch the felt piece to the center of your glove, or if you want an asymmetrical look stitch it to the feather center placement (if you don't sew you may also hot glue or fabric glue the felt piece.) 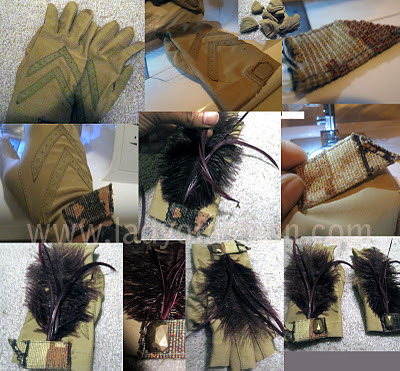 Place feather(s) to desired location of the glove, pin in place, then use hot glue or fabric glue to adhere them to the glove. Cut excess stems, and/or feather pieces. For tabs/straps: I used the last remnants of my animal clutch. I cut them into the length of the glove hem, and stitched one end to the glove hem. 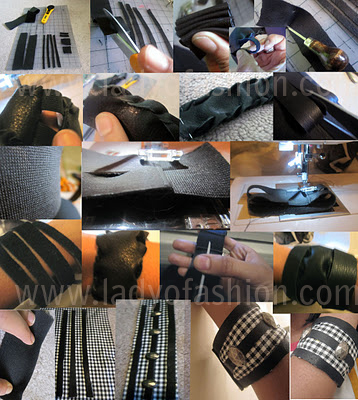 For the other end of the tabs you may use Velcro or just stitch it to the glove. Though only for display, I wanted the tabs to look functional, hence the added Velcro on my version. *I used feathers for my trim, but you may use any kind of embellishment. I have much more to share with you, but as always... in due time my dears. Enjoy! Don't forget to spread the love! Love the gloves! Feathers give them such a nice touch and I like that you made them fingerless. Those feathered gloves are super hot. Absolutely love them. I have just made cuff bracelets out of an old belt. I love it!!! You are so creative!!! I'm a sucker for feathers! Those are so so awesome. I wish I had half as much creativity as you! I am about to get so crafty - love this (don't even get me started on the feathered gloves)! Great DIYs! i'll try the watch accessories! I love those gloves -- so cute! Very creative DIY tutorial, dear. Thank you so much for sharing. I can use one, especiall that glove me tender idea. What a great idea!!! SO creative!!! Hi, So happy that you liked the gloves! Thanks so much for viewing. Have a great day! Hello Silvia & welcome! Thanks for commenting. Glad that you enjoyed this DIY. very creative ! love your cuff bracelet ! 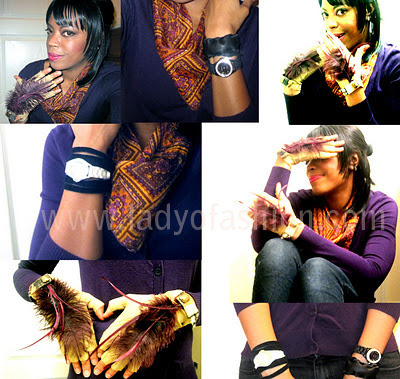 haha, thanks Courtney, the fingerless gloves were exciting to make... can't wait to wear again soon! I love all your DIYS! SO funky and so cool. This would be so perfect for Halloween just around the corner! Thank you Lauren dear! Yes, these gloves will be perfect for Halloween, and a dinner party that I'll be having soon. Love the feather gloves! Fun project.